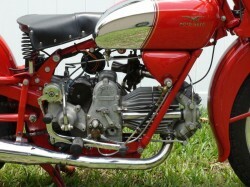 That little eagle on the tank is in honor of Giovanni Ravelli, one of the trio of young, Italian aviators who planned to start Moto Guzzi while serving together during World War I. Ravelli was killed in the closing days of the conflict, but his surviving comrades founded the other company that uses an eagle in their iconography. 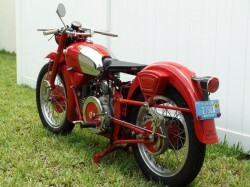 But, prior to the V-twin powered V7 of the late 60’s, Moto Guzzi was famous for its big singles. 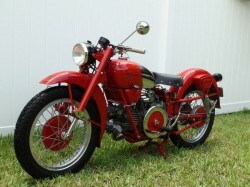 Successful on the street and in racing, the “horizontal single” was a distinctive looking machine, with the barrel pointing forwards and a long, sleek silhouette. 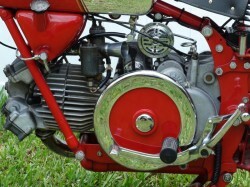 The gearbox arrangement did not allow for a traditional flywheel to have sufficient mass, so Guzzi hung a flywheel outside the cases that looked for all the world like a giant deli meat-slicer. The bike’s center of gravity was very low and the bike had relatively small frontal area, decreasing drag and allowing the 500cc motor’s 23hp to push the bike to surprising velocities. The engines typically have a very lazy character: you can just about count the combustion events at idle and they’ll just thump along for hours on end at the bike’s 85mph top speed. 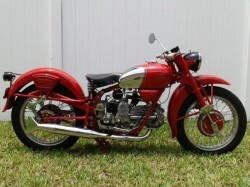 Produced between 1950 and 1963, the Falcone is an iconic, much sought-after bike. 10 year old restoration. 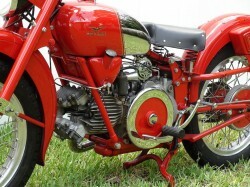 AMCA judged in 01 as a J2. Probably under 20 miles since restored. A beautiful bike, the chrome in near-perfect shape. Paint is very nice. It is a 1 kick start. I have owned for 4 years. It started to drip fuel last year on the tank to carb line, but I never replaced, just drained the tank. It drips oil from behind the fly wheel. I dont know if this is normal or not. Purchased as an investment and planned to hold onto for more than 4 years however my circumstances have changed. Without doubt the most admired motorcycle that I have owned. It’s a pretty nice, usable vintage bike that sounds to be in nice shape, barring a few minor leaks that one would expect from bike this age. It’d also be a surprisingly classy way to buff your left shoe to a mirror-like shine.